BrainyZanyGames is the PUP that uses misleading techniques to prevent removal. Use Reimage to locate malicious components and get rid of them faster than with uninstall instructions. A full system scan blocks virus reappearance and prevents traffic to malicious domains. BrainyZanyGames is an adware which pushes annoying ads. BrainyZanyGames is an online gaming platform which is also categorized as an adware program. It enters the system as a browser extension and initiates certain modifications. As a result, users receive numerous intrusive ads which might redirect to less than reliable pages. Usually, it infiltrates on most popular browsers, including Mozilla Firefox, Google Chrome, Safari, Internet Explorer, etc. 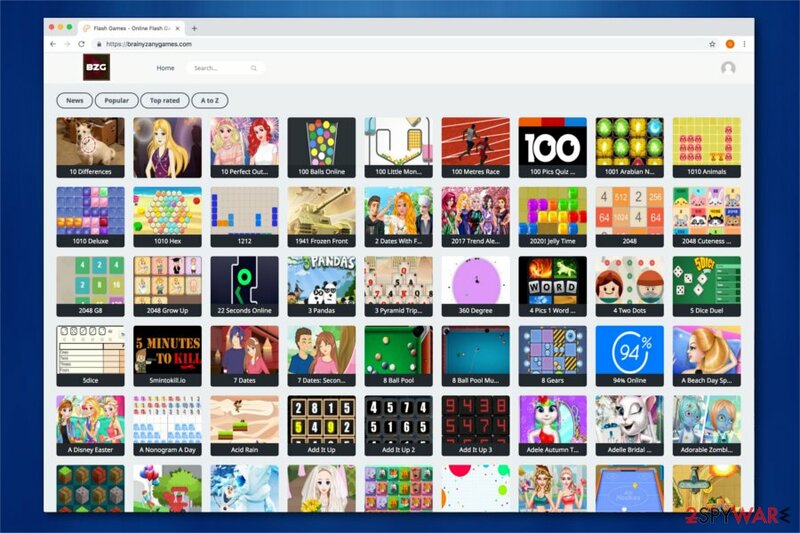 Users can unconsciously install BrainyZanyGames extension together with third-party software. Once installed, it starts monitoring the user's behavior and collecting information about browsing habits. Even though this data is classified as non-personally identifiable, there might be cases where it could cause privacy-related issues. Keep in mind that BrainyZanyGames ads may be not only annoying but also dangerous. Since developers of potentially unwanted programs (PUP) aim to maximize their profits, they push various online content without checking it first to gain pay-per-click or pay-per-install revenue. As a result, you might encounter malicious ads or redirects to malware distribution sources. BrainyZanyGames is a potentially unwanted program which enters the system as a questionable browser extension. Therefore, you should remove BrainyZanyGames without hesitation. We believe that there are numerous other reliable online gaming platforms that you can use instead. The easiest way to clean your browser from suspicious extensions is to run a full system scan with a professional antivirus. Once BrainyZanyGames removal is complete, you can use Reimage to optimize your system and get rid of any damage the virus has made. Our experts highly recommend performing regular system scans to improve your PC's performance and allow you to enjoy browsing again. Usually, adware programs enter the system as browser extensions. They are bundled with freeware or shareware and this way the user unconsciously installs them on the computer. However, there are ways how you can detect and opt out all unwanted components when installing software. You should change the Quick/Recommended mode to Advanced/Custom one and attentively follow installation stages without skipping any steps. Once you notice pre-selected options that allow installing questionable software or extensions, de-select them and double-check your PC with an antivirus. If you are annoyed by ads and e-commerce content during browsing sessions, you should remove BrainyZanyGames and the related adware. The best option would be to run an entire system scan with a malware removal tool. Note that it automatically detects all elements of the infection and cleans your PC within several minutes. However, experts note that manual BrainyZanyGames removal is also possible. Although, this option might require specific IT skills. Thus, users are advised to use the instructions provided at the end of this article. Later, don't forget to reset each of the affected browsers. Steps to do that are appended below as well. Here, look for BrainyZanyGames or any other recently installed suspicious programs. Wait until you see Applications folder and look for BrainyZanyGames or any other suspicious programs on it. Now right click on every of such entries and select Move to Trash. When in the new window, check Delete personal settings and select Reset again to complete BrainyZanyGames removal. Once these steps are finished, BrainyZanyGames should be removed from your Microsoft Edge browser. Here, select BrainyZanyGames and other questionable plugins. Click Remove to delete these entries. Now you will see Reset Firefox to its default state message with Reset Firefox button. Click this button for several times and complete BrainyZanyGames removal. Here, select BrainyZanyGames and other malicious plugins and select trash icon to delete these entries. Click Reset to confirm this action and complete BrainyZanyGames removal. Here, select Extensions and look for BrainyZanyGames or other suspicious entries. Click on the Uninstall button to get rid each of them. Now you will see a detailed dialog window filled with reset options. All of those options are usually checked, but you can specify which of them you want to reset. Click the Reset button to complete BrainyZanyGames removal process. This entry was posted on 2018-09-27 at 11:21 and is filed under Adware, Viruses. You can quickly scan the QR code with your mobile device and have BrainyZanyGames manual removal instructions right in your pocket. 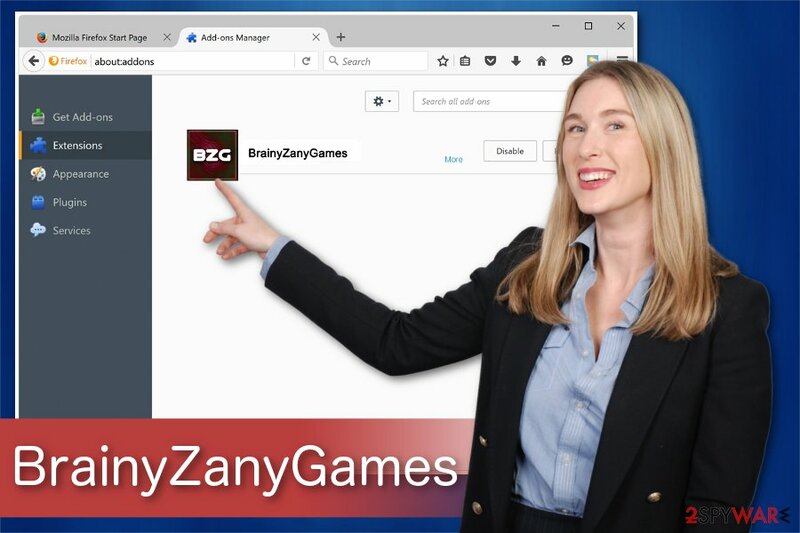 How did you remove BrainyZanyGames?